Maintaining a food blog is quite a challenge when you have a stomach bug and no real appetite. I usually have two or three recipes plus pictures on the shelf that I can use. But even if I don't have to deal with real food, I get picky on what to put onto the blog. My current stomach bug doesn't allow sweet things. For nothing in the world I could share a cookie recipe with you today. However, my stomach bug allows savory vegetables. I had enough energy to cook something up, and even try a new recipe. Aubergines are actually not very high on my list of favorite vegetables. I find them too tasteless, sometimes bitter, and don't really like the texture when they are cooked. When I came across the idea of marinating them before roasting in the oven, I was hooked on. Today seemed the right day to try it. Even if the recipe would turn out inedible, my stomach bug would probably be as happy without lunch. Further motivated by using my homegrown basil and mint, I started cooking. And after taking some pictures, polished off the whole dish that is stated below to be enough for 2-4 people. It was good. The key is not to use too much vinegar, as it can be quite overpowering. The amount of marinade seems little but it is enough to season the vegetables. 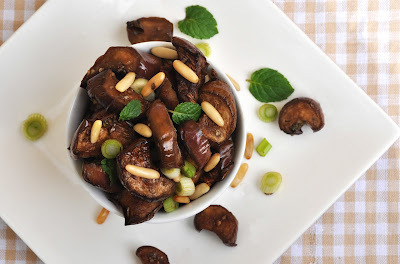 I can imagine this aubergine salad a good side dish for any BBQs or potlucks. Bon appetit! Cut the eggplants into halves lengthwise, then slice into 1/2 inch slices. In a small bowl, combine vinegar with olive oil, garlic, basil. Season with salt and pepper. Pour the mixture over the prepared eggplant and toss until well coated. Cover and let stand for at least 30 minutes. Lightly grease baking sheet. Spread the marinated eggplants in one layer onto the sheet and bake for 15-20 minutes, or until aubergines are tender. In the meantime, roast the pine nuts in a dry pan over medium-low heat for a 4-5 minutes. Transfer cooked eggplants to serving bowl and toss with chopped spring onions, mint leaves and toasted pine nuts. Serve warm or at room temperature.